MUNICH — Noisy and sustained boos fell upon stage director Christiane Pohle and her team after Pelléas et Mélisande last night here in the Prinz-Regenten-Theater. Though not uncommon in this epoch of Regietheater, the intensity of the scorn for Bavarian State Opera’s new production was alarming coming from the dressy summer festival premiere crowd, many of whom were to adjourn to parties after the performance and whose circles deplore boorish behavior. The fifteen scenes of Debussy’s 1902 drame lyrique to a Symbolist libretto by Maeterlinck unfold in Pohle’s conception in a hotel lobby, with Mélisande as a receptionist. Scene I, where Golaud nominally loses his way while hunting in a forest, has him seated drinking at the hotel’s bar. Scene XV, in which Mélisande will admit no guilt, takes place as a loose, group-therapy session. The stationary lobby set, with hard, photo-realistic surfaces that look good on camera, is of a type costly to build and awkward to move, restricting scenic transformation in a way ordinary theatrical flats do not. After Golaud’s forest, Maeterlinck and Debussy call for une appartement dans un château, a setting devant le château, une fontaine dans le parc, une grotte, une des tours du château (from which Mélisande’s hair cascades down to Pelléas), les souterrains du château, une terrasse, and so on, a visual feast potentially. BR Klassik carried the audio last night, preserving a musically imaginative performance. The Bavarian State Orchestra conveyed ravishing nuances as well as the burliness in Debussy’s score as led by Constantinos Carydis. Markus Eiche sang a lucid Golaud in properly projected French. Elena Tsallagova’s lovely tones proved ideal for Mélisande. As a mostly effective Pelléas, Elliot Madore followed bizarre stage directions: on his first date with Mélisande, for instance, he sat with his knees together while she stood. Okka von der Damerau inertly impersonated Geneviève. Peter Lobert as the Doctor outsang Alastair Miles’ Arkel, while Hanno Eilers, 12, of the Tölzer Knabenchor intoned Yniold bravely and drew the loudest applause. 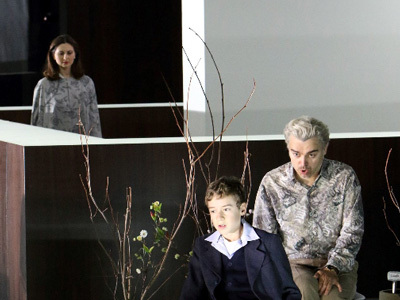 Pelléas et Mélisande becomes the latest of numerous flops for the company’s impenitent Intendant Nikolaus Bachler, who insists on freedom for his stage directors — many of them grounded in straight theater and lacking flair for the visual and inter-disciplinary aspects of opera — without apparently recognizing his own duty to monitor quality during production development. Guillaume Tell (Antú Romero Nunes) and Věc Makropulos (Árpád Schilling) have been mounted here with jaw-dropping ineptitude over the last twelve months. Earlier stagings of Medea in Corinto (Hans Neuenfels) and Saint François d’Assise (Hermann Nitsch) went speedily to the dumpsters and to costume sale, the probable fate of this Debussy. This entry was posted on Monday, June 29th, 2015 at 9:36 am	and is filed under Munich Times. You can follow any responses to this entry through the RSS 2.0 feed. Both comments and pings are currently closed.